Brighton Sharbino Photos, News, and Videos | Just Jared Jr.
Nia Sioux steps out for Indiana Massara and Brighton Sharbino‘s joint birthday party on Sunday evening (August 12) in Sherman Oaks, Calif.
Just a few hours before, the 17-year-old actress was on the pink carpet at the 2018 Teen Choice Awards, where she was a special correspondent. Nia even ran into longtime friend, Maddie Ziegler, and shared an adorable throwback on Instagram. 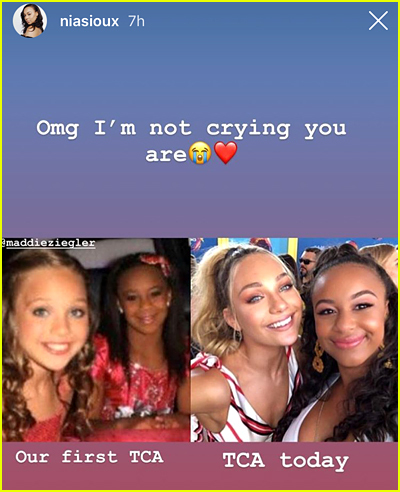 “Omg, I’m not crying, you are,” Nia wrote with the pic, showing off her and Maddie‘s first Teen Choice Awards and this year’s, side-by-side. Check it out below! Lilimar, Mason Cook, Sofie Dossi, Carson Lueders and Annie LeBlanc are also pictured below at the party. Ashley Tisdale channels her inner goth girl for the 100th episode celebration of The Walking Dead held at the Greek Theatre in Los Angeles on Sunday (October 22). The producer and actress brought along her husband, Christopher French, for the event which also celebrated the season eight premiere. Ashley is a big fan of the show and has attended the premiere events since season 4. Christian Serratos, Sydney Park, Kyla Kenedy, and sisters Saxon and Brighton Sharbino were also at the event. We are so jealous about everyone who attended the Guess Holiday Party last night — they got to hear Madison Beer sing! The singer and social star performed a few songs at the annual event and maybe, might have heard some new stuff! “everything. thank you for having me sing tonight,” Madison wrote on Instagram after the party. Empire‘s Sierra McClain, Luna Blaise, Jessie Paege, sisters Brighton and Saxon Sharbino, Renee Olstead, Larsen Thompson, Brec Bassinger, Kayla Maisonet, Landry Bender, Chandler Kinney, Belle Shouse, and Haley Tju were also at the party.